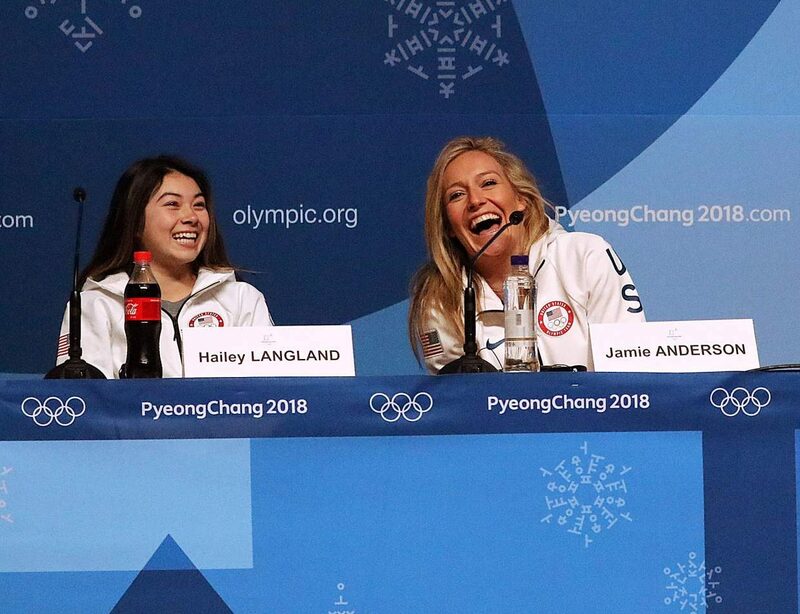 Jamie Anderson, right, of South Lake Tahoe, California, laughs as teammate Hailey Langland looks on during a news conference for the U.S. slopestyle snowboarding competitors Tuesday, Feb. 6, in Pyeongchang, South Korea. Anderson said she’s feeling rested and ready after taking a few days at home at Tahoe before hopping on a flight to Korea. 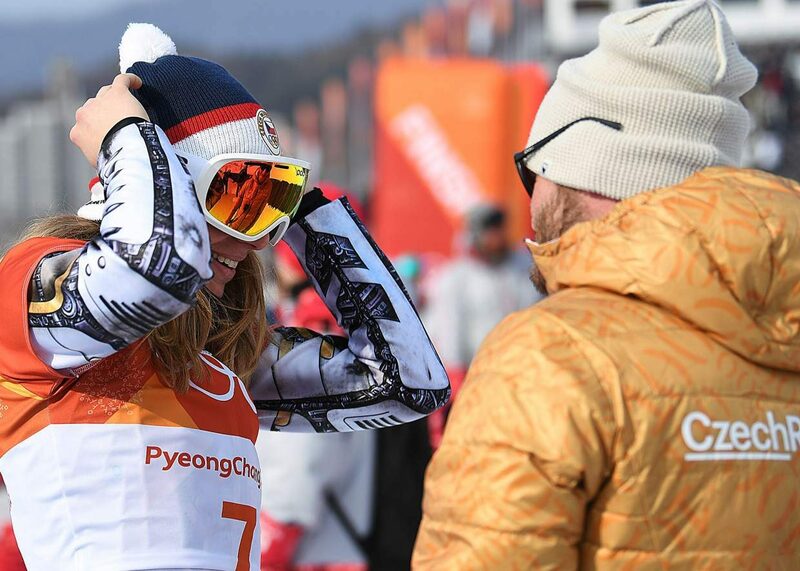 PYEONGCHANG, South Korea — Jamie Anderson is more at ease in her return trip to the Olympics — but is still feeling pressure from the young U.S. slopestyle snowboarders that aim to dethrone her as reigning gold medalist. 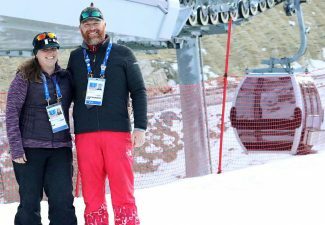 The women’s slopestyle snowboarders took a quick tour of the slopestyle course on Tuesday. The course is technical with huge rails and potentially bad consequences for a mistake, Anderson said. “To be honest, I was pretty scared, so I just went and rode powder on the side for, like, five laps with a couple friends,” she said. They will begin practice on Wednesday, with qualifications Sunday and finals Monday at the Phoenix Park slopestyle course. 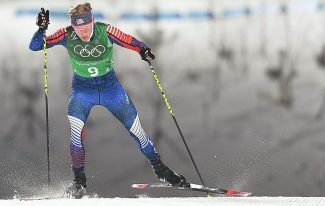 The veteran Anderson, 27, is joined on the team by repeat Olympian Jessika Jenson, 26, as well as Olympic rookies Hailey Langland, 17, and Julia Marino, 20. 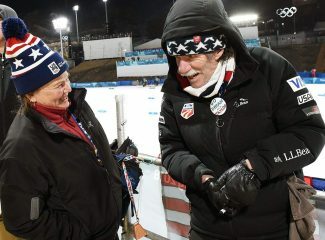 Anderson — who was one of nine American gold medal winners in Sochi — said she welcomes the infusion of young talent into slopestyle snowboarding. She said the sport had grown stagnant — that is, until young snowboarders like Langland and Marino burst onto the scene. Langland and Marino both won gold at X Games in 2017 — Langland in big air and Marino in slopestyle. At the same time, Langland and Marino are benefiting from tapping into Anderson’s experience. They all traveled to Korea together and are staying together in a house. 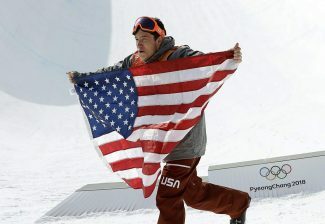 The strong roster gives the U.S. a chance for its first podium sweep in women’s snowboarding, Anderson said.